My husband recently took a test that scored him a 95% on the scale of extrovertedness. He loves to be the centre of attention, he loves to be around people, and he loves to speak his mind. He absolutely loves an audience. Then there’s me. I would most likely score a 95% on the scale of introvertedness if I were to take the same test. I long for time alone, love the quiet, need a few lessons in conflict resolution, and avoid attention at all costs. There are two ways I could look at our situation – an extreme introvert living with an extreme extrovert. I could try to change him and be miserable with trying to keep up with his social schedule, or I could appreciate the differences in us and seek a balance that works for our social needs. I tried the ideas mentioned first, but to no avail. Josh was quite happy with himself (as he should be), and I was exhausted from all the mingling. After 10 years of marriage we’ve learned more and more about loving each other for who we are, and trying to meet each other where we’re at. I am free to stay home if I’m mingled-out, and he’s free to sing in the grocery store. 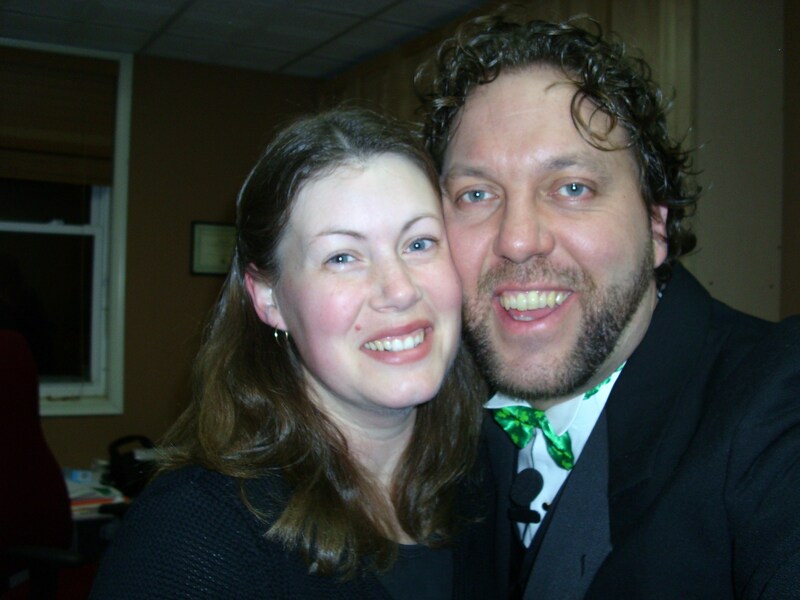 I remember when we first married, he would grab my hand as we did a few groceries, start belting out a big-band tune and twirl me around the aisle. It was more than I could handle most days, but he learned to tone it down, and I learned to live in the moment, red cheeks and all. Today we had reason to visit a medical clinic (no worries, nothing major! ), and as soon as we walked into the small waiting room, I could feel the inspiration building in Josh. A little girl was trying to keep herself amused in a very boring atmosphere, and she was singing a song and dancing around. He immediately started singing and dancing along. He had the whole waiting room laughing. And I stood beside him and smiled. It took me back to when I first met him – I was a receptionist at a chiropractor’s office and he was a patient. Every time he came in for an appointment he’d have everyone laughing within minutes. I remember sitting behind my desk, pulling up his file on the computer, and checking to see if he was my age. P.S. As soon as my husband read this post, he had a great idea – I should write a blog solely about him. Ever the extrovert. I replied, “So you can have an even bigger audience!” And we had a good chuckle about it. In a course I completed a few years ago, we both did a battery of tests and profiles. One showed our personality trait in the area of extrovert vs introvert. The person who went over the materials with me shared that he had never seen a couple so far apart on the scale as the two of us. Thinking that her shyness was something to be fixed, I tried to introduce her to the outgoing life in a few ways. To start with, I just dragged her along on my hectic and relational schedule and figured that she would pick it up as we went along. All she did was get tired. I went back to the drawing board and tried to slowly turn the temperature up a degree at a time with the same results. At the end of the day when everyone had gone home and I was chomping at the bit and ready for more, she was cocooned in a blanket in a catatonic state on the couch. And then one day it hit me (no, Anna didn’t hit me, I was too quick). I realized that all the energy that I was pouring into others relationally could be better spent if I poured some of it just into her. And as I took the time to sit with her and watch the sunset, stroll along the boardwalk at the lake, or read in bed before turning out the lights, I saw a wonder and beauty that I had sometimes missed. Yes, I saw the beauty of the setting sun and the cool evening breeze off the lake, but most of all, the beauty inside Anna that I fell in love with. A strong and peaceful spirit that tries to live in each moment and helped me to do the same. Yes, I am comfortable in the spotlight. Yes, I am energized by being with others and laugh-ing, talking, and playing. Yes, there are roles that I must fulfill that require me to do these things. But more than that, I have come to realize that I am most at home when I am with Anna and fulfilling the most important roles in my life – husband and father. Instead of focusing on all your differences and personality traits that tend to frustrate or annoy one another, focus on the things you love about your husband or wife. Look for the positive, and start making a mental list. Write a special note or send an e-card to your spouse that highlights 3 things from your list. Lord, thank You for our marriage. Help us to always see the good in one another in the midst of the stresses and frustrations that sometimes come with family life. Remind us constantly of the things we love about each other and help us to encourage each other always. In Jesus name, Amen.